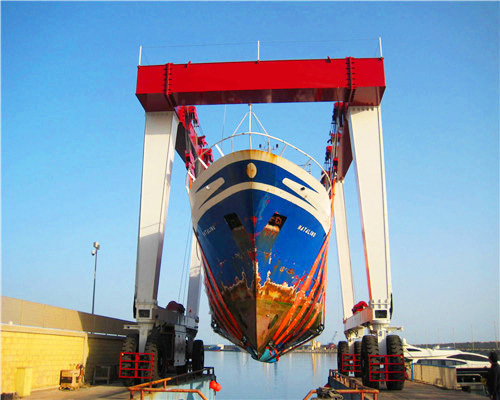 Boat travel lift is a kind of mobile gantry crane for boat hauling in ports, which is a kind of portal use crane manufactured by Aimix Group. 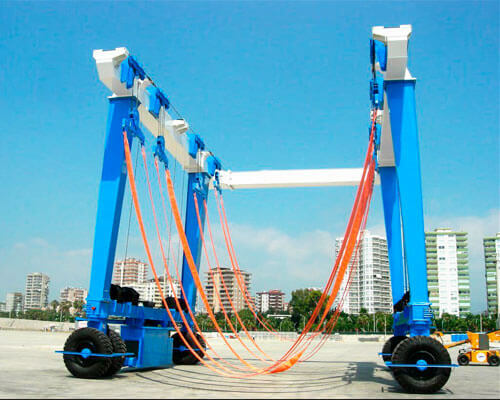 This boat lift is specifically designed for different kinds of boat handling, such as to launch a boat, lift it out of the water and transport these vessels in the yard. We provide different types of boat travel hoists to promote your marine industry efficiency and help you profit more from your industry. Cost effective, high performance, and one-stop service will save your costs and investments both in time and money involving in this purchasing project. 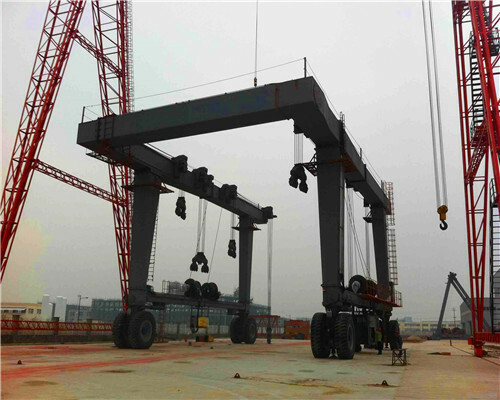 Since the company has its own boat hosts manufacturing division, any types of these cranes you need, the company can manufacture for you. Whatsmore, the boat travel hoists manufactured from our factory are also applied to different kinds of boats with different kinds of capacities and materials. 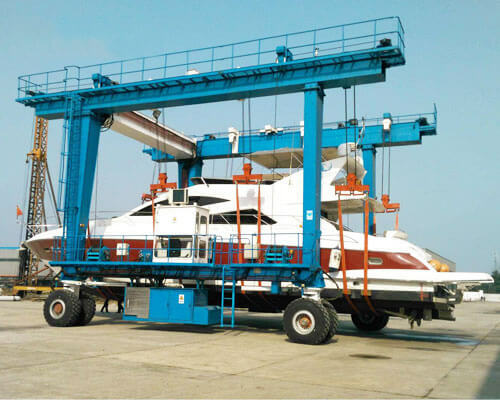 If the above-listed types of boat lifts are not perfectly meet your own boat requirements, please be free to contact us, the company can provide you individual boat hoists travel lift solution. Hook up Adjust: The unique sling of the boat travel lift configured with different types of mobile boat hoists which improve the capacity of the lift to a large degree. The design also enables the boat hoists operator to balance the loading materials easily and avoid stabilizers or other sensitive elements on the hull. Motorized 90 Degree 2-Wheel Direction-finding: From limited spaces in storing amenities to constricted turns around the harbor, Motorized 90 Degree 2-Wheel Direction-finding provides a tighter turning radius and helps get every boat exactly where it needs to be, easily and efficiently. Special Spindle Trunnion Configuration: Structural stress reduction and huge yards can be easily accommodated. The special spindle trunnion design enables your boat lifts to easily travel over rough ground, such as the unaltered filth and materials. Stainless Fortify Tubes: Corrosion resistance in severe marine environments with stainless steel tubing. Fastening Flange in Upper Beam: Offers greater versatility with the calm reconfiguration of the boat hoist’s dimensions to meet various hull requirements. Formed Steel Structure: Extend the service time of your boat travel lift. It gives the boat hoist more strength for more heavy-duty work year after year. Self-regulating Hoists: Provide operators with full control of the load with separate independent control levers for each hoist. Separate pumps power each hoist, helping to synchronize every lift. Stress-free Access Engine: Fiberglass compartment eliminates corrosion, reduces noise and provides easy access to routine maintenance points. Chine & Capsize Pads: Protect slings from resistance and abrasions with rubber-reinforced coverings that extend the life of your slings. Comfortable Crane Operator Cabs: Quick and easy access to all controls so the operator can lift and move the mobile boat hoist with exactness. It can also serve as a mechanical backup for the optional wireless remote control. 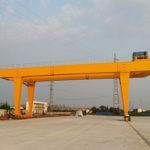 In such a competitions crane manufacturing industry, before you come to our crane online manufacturing site, you must spend some time on selecting a reliable crane supplier. A cost-effective, high quality, high performance, totally match for your special requirements are your priority to choose a boat travel lift supplier. 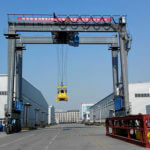 As a recognizable integrated crane company, we have our own crane factory and crane research and development institutions, and we also have forged cooperation relationships with the boat lifts international companies and boats hoist in China, thus all types of our products are configured with cutting-edge technology and high performance. The following we will provide you with some wiki knowledge related to the boat hoists if you just have a new boat travel lifts, you can also read for reference to avoid unexpected problems during operation. To let you know more about our products and series and help your crane operator run the lifts smoothly and safe, we display more details about our products and services. Or if you have any questions about the product, you can also make direct contact with our crane engineer. 25 ton travel lift: The 25t boat hoists can lift the full range of small boats at your yacht or sailing club. It is available with various hoist speeds. The boat travel lift is also an extended negative drop to accommodate significant tide fluctuations. 50 ton travel lift for sale from crane factory can give your yacht or sailing club the power to lift a wider variety of smaller boats. 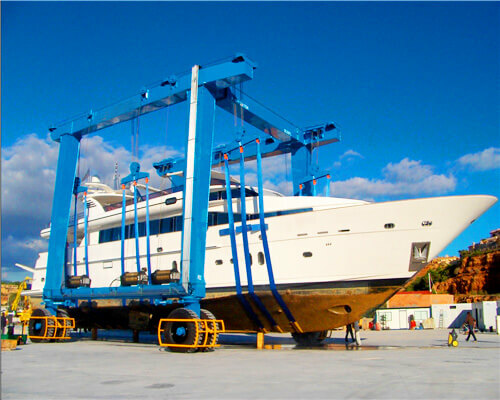 The mobile boat hoist offers more lifting capacity than the 25t one, and like all boat travel lifts and mobile boat hoists, it can be built to custom sizes to meet the demands of your facility. 75 ton travel lift: it is manufactured to increase your lifting capacity while improving speed and efficiency. 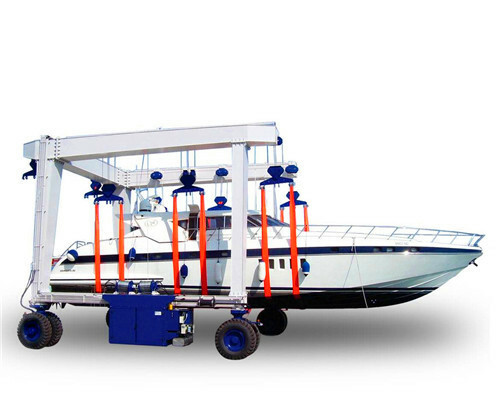 Among the different capacities of boat travel lift, the 75t one provides high-performance, safe and reliable operation. 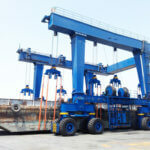 100 ton travel lift sale: it can keep your marina or boatyard on schedule. 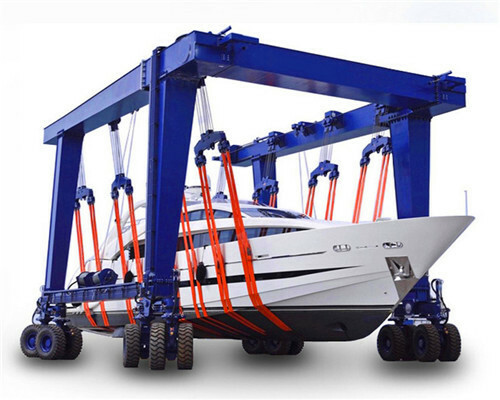 The 100 ton boat lift crane is easily expandable with fully adjustable hoist blocks while retaining its full lifting capacity. 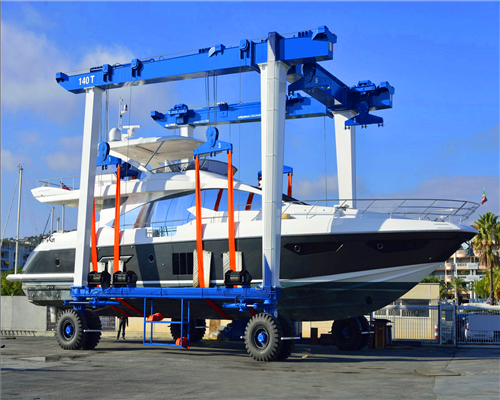 200 ton travel lift: it enables you to lift the boats day in and day out with confidence. This kind of mobile boat hoist is ideal for salt-water marinas and available with a wide variety of options to ensure you get the right machine to meet the demands of your yard. 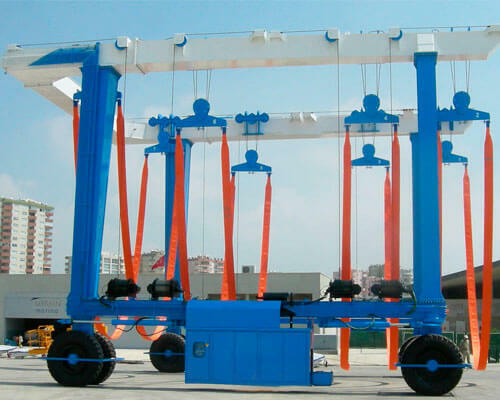 The boat travel lifts is a kind of gantry crane lifting equipment used for boat hauling and hoisting. Boat travel hoists can haul out different kinds of boats, such as the lifetime boats, wood boats, yachts, ships and so on. Our boat lifts can mobile your boats from shores to the ports to smooth your way to the sea sailing or fishing industry. 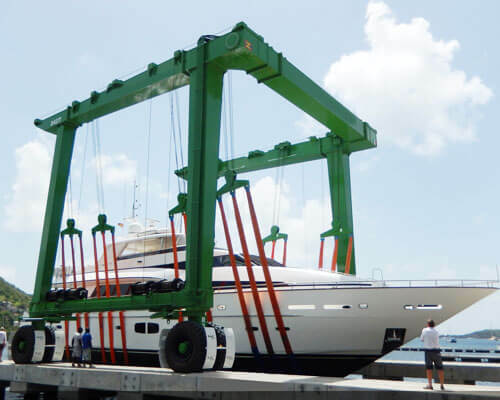 How to choose a reliable boat lift carrier manufacturer? The first reason you choose a crane supplier maybe its product quality, based on winch you will compare to the same level supplier and the one offer the lower price you will take it into consideration. 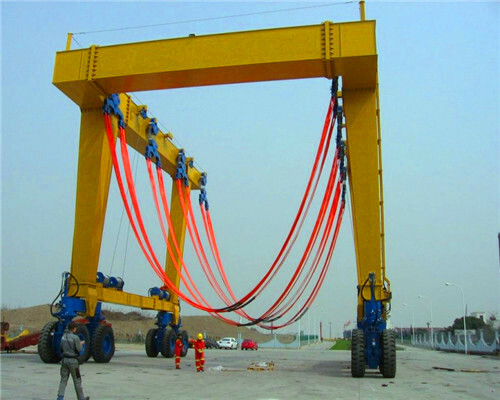 Then, as a heavy lifting equipment, a full-service chain is also an important factory you should take into consideration which includes crane design solution, purchasing suggesting, customized crane service, after-sale service system, etc. The entire service system needs an integrated crane machinery to support, and the crane is the one you shall not miss for a boat travel hoist exclusively for your boats. 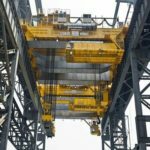 Cost-effective cranes: in depending crane manufacturing, factor price level; no third party involved in, no additional charges added. Do you need a customized boat hoist? 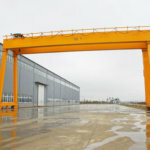 We can provide its customized services both in its crane design and crane parts. 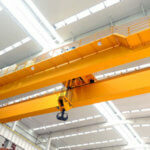 Some will enable your mobile hoists to work in a high performance while some will promote your crane operation safety. 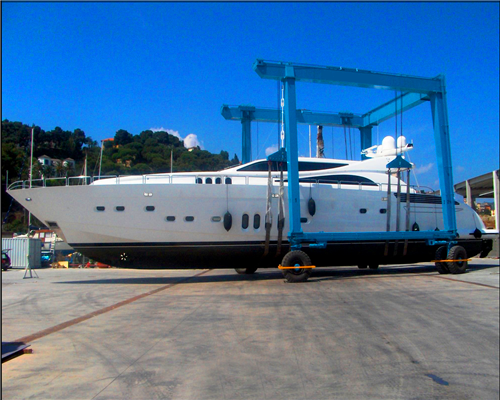 Boat hoists configured with wireless remote control will improve operational safety and manoeuvrability. The wireless remote control increases the visibility of the boat, launching piers and surrounding area. 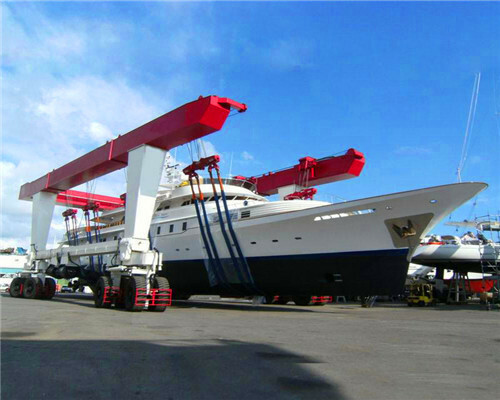 Top Beam Extension: with such crane configuration your boat travel hoists will lift different kinds of boats quickly. Top beam extensions provide additional clearance without needing to adjust the vessel’s rigging. All Wheel Electronic Steering: lead to a boat travel lift with high versatility, manoeuvrability and precision in confined boat yard spaces with patented all-wheel steering technology. The system includes 5 steering modes with more drive and turning speed. Sound Suppression System: create a quiet and comfortable operation environment in your ports. CE Certification: provides full CE compliance for valued customers in the European Union. Electronic Load Indicator: upgrade your crane control system, promote your crane working performance. Increased Gradeability: working space saving. Work & Drive Lights: High-mounted and/or low-mounted 12-volt DC lights illuminate work and drive areas and run off the crane’s electrical system. Custom configurations are available. Ensuring a higher safety operation environments for your industry. Customizable Height & Width: boat hoists are available in custom heights and widths to meet the specific requirements of your yard. 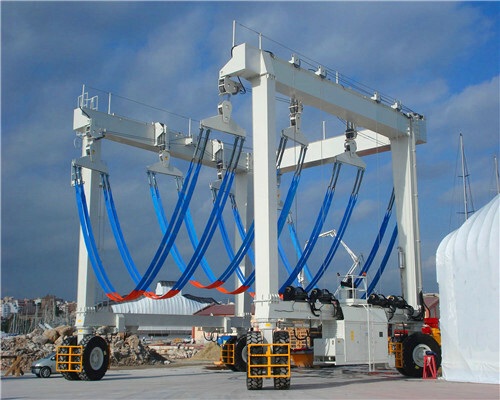 Equipped with Jib Crane: Move loads on or off a vessel while it’s in the slings. 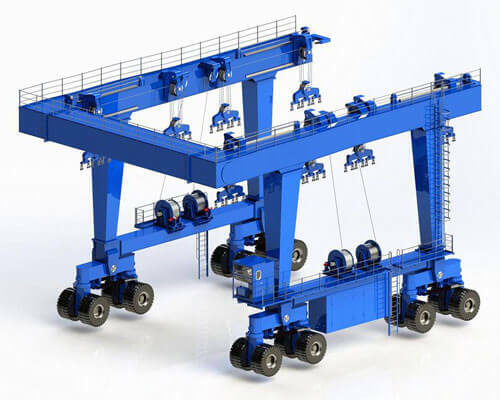 Each telescopic-powered crane is controlled separately and mounted to the upper structure of the boat hoist. Enclosed Cab: Ensure maximum operator comfort (particularly in colder climates) with a lockable door, sliding windows, windshield wiper, heater and window defrosting fan. Optional air-conditioning is also available for the enclosed cab. Custom Colors: All boat travel lifts machines can be painted with a custom colour. All the above crane configurations are available for your reference, if you have additional customized requirements, please be free to contact our crane engineer. This is the boat travel lifts operation guide, especially for your boat hoist operator reference. If your crane operator needs such crane operation services, the company can provide you crane operator onsite training, video training, and manual training are all available for your operator. Install the safety protection system.